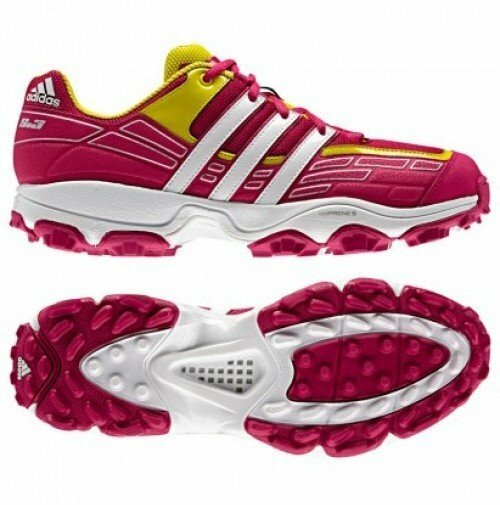 Brand new to All Rounder Hockey the Adidas adiStar S3 Pink Hockey Shoe for the Hockey Season. ADIDAS ADISTAR HOCKEY S.3 Synthetic (Female version) dark onix / hi-res orange f13 / running white Torsion System TRAXION® outsole for maximum grip in all directions. Pro-Moderator + Lightweight, durable midsole wrapped stability element that eliminates the risk of mid foot irritation. Mesh forefoot and synthetic sidewalls for breathability and lateral protection. ADIPRENE insert in heel for maximum comfort and shock absorbtion adiPRENE®+ adiPRENE®+ maintains forefoot propulsion and efficiency. The S.2 was great, the S.3 is unbeatable. Lighter than ever with mesh ventilation, midfoot and heel support, and reinforced sides for rapid dribbling and direction change. Pick up your brand new Adidas adiStar S3 Pink Hockey Shoes now from All Rounder Hockey.